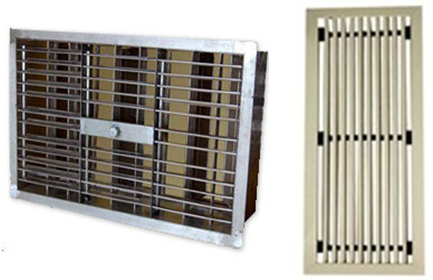 Aerofoil louvers with 0, 150, 300, and 450 deflection suitable for side wall, floors sill and ceiling mountings. Extruded Al, mild steel or stainless steel. Designed with Nylon Bushes for efficient, smooth and quiet operation & to avoid rattling noise. Designed to reduce ceiling smudging. Brings about proper airflow pattern and uniform air distribution. Negligible resistance to air flow. Powder coated in attractive colors.